The Canadian Transportation Agency (CTA) – Canada’s longest-standing independent regulator and tribunal – has made remarkable progress on multiple fronts in recent years, and expects to bring a number of key projects to fruition during 2019–20. One of those projects is the Regulatory Modernization Initiative (RMI). Launched in May 2016, the RMI involves a comprehensive examination of all regulations administered by the CTA, to ensure they reflect current and emerging business models, the needs of travellers and shippers, and best practices in the regulatory field. The RMI was divided into four tranches: accessible transportation, rules for airlines around matters like code sharing, air passenger protection, and rail-related regulations. It was helped along not only by the extensive engagement of the public and stakeholders, but also by the adoption of the Transportation Modernization Act, which gave the CTA new rail-related responsibilities and a mandate to set minimum airline obligations towards passengers. By March 2019, proposed regulations in the first three areas covered by the RMI had been pre-published in Canada Gazette I and work on updates to the rail-related regulations was well-advanced. During 2019-20, the CTA will consider feedback on all the drafts, endeavour to finalize the regulations, and turn its attention fully to implementation. Two key priorities will be developing plain language guidance material and putting in place a risk-based compliance monitoring and enforcement program. In addition, the CTA expects that in 2019-20, the trend of rising complaint volumes – spurred in part by growing public awareness around air passenger and accessibility rights – will persist. We’ve handled the more than ten-fold increase in the number of complaints (from about 700 averaged annually between 2012-16 to 7,500 in 2018-19) through a mix of internal streamlining, supplemental funding, and the use of informal facilitation and mediation to resolve the vast majority of cases. In 2019-20, we’ll continue to do everything possible to make our dispute resolution services as straightforward, fair, and efficient as possible. Finally, 2019-20 will see the release of a report on the storage and transportation of mobility devices on aircraft, based on multi-stakeholder discussions initiated and supported by the CTA, and efforts by the CTA and partners in other federal agencies to ensure that accessible air travel figures on the agenda of the International Civil Aviation Organization, notably during its triennial General Assembly this September in Montreal. Canada is a particularly transportation-reliant country, and both here and abroad, this is a dynamic period in the world of transportation services. The CTA’s exceptional team of professional, dedicated Members and public servants works hard every day to help foster an efficient, competitive, and accessible national transportation system – in the interests of all Canadians. It helps ensure that the national transportation system runs efficiently and smoothly in the interests of all Canadians: those who work and invest in it; the producers, shippers, travellers and businesses who rely on it; and the communities where it operates. It protects the human right of persons with disabilities to an accessible transportation network. It provides consumer protection for air passengers. Rule-making: It develops and applies ground rules that establish the rights and responsibilities of transportation service providers and users and that level the playing field among competitors. These rules can take the form of binding regulations or less formal guidelines, codes of practice or interpretation notes. Dispute resolution: It resolves disputes that arise between transportation service providers on the one hand and their clients and neighbours on the other, using a range of tools from facilitation and mediation to arbitration and adjudication. Information provision: It provides information on the transportation system, the rights and responsibilities of transportation service providers and users, as well as its legislation and services. Canada's transportation system is a complex, rapidly-changing network that is vital to the country's prosperity and social cohesion. To deliver its mandates, serve the public interest, and meet the expectations of Canadians, the CTA must remain aware of and keep pace with emerging trends and changing conditions. The CTA's longest standing mandate is to keep the national transportation system running efficiently and smoothly. Demand for the CTA's services in this area over 2019-20 will be shaped, in part, by amendments to the Canada Transportation Act made in May 2018. Of particular note, the CTA is now authorized to initiate investigations into possible freight rail service issues, on its own motion, with the authorization of the Minister of Transport. In January 2019, the CTA launched an investigation into possible freight rail service issues in the Vancouver area. The matters covered by the investigation include whether there is evidence of discriminatory treatment of certain commodities, how freight rail permits and/or embargoes are being used, and whether railway companies operating in the Vancouver area are fulfilling their service obligations. The CTA concluded that an investigation would be appropriate based on information received from shipper associations and other parties. As part of its Regulatory Modernization Initiative, the CTA is also working to update rail-related regulations and guidance material based on feedback from rail stakeholders during consultations held in 2018. The goal is to have updated regulations in place by summer 2019, with new guidance material to be released throughout 2019-20. The CTA's role in keeping the national transportation running efficiently and smoothly is not limited to rail; it includes, for example, administering Canada's air licensing and charter permit regime. The CTA is working to update its regulations pertaining to air licensing and charter permits. Proposed amendments to the Air Transportation Regulations contain conditions and limitations on how air services will be provided which reflect a highly regulated regime from the past and which are no longer required in today’s competitive and open aviation markets. Changes to the regulations will clarify and streamline CTA’s internal processes with a consequent reduction in the administrative burden on the industry. The goal is to have these regulations in place by the summer of 2019. The CTA is developing new Accessible Transportation for Persons with Disabilities Regulations, as part of its Regulatory Modernization Initiative. The proposed regulations will establish legally binding accessibility requirements for transportation service providers. Consultations on the regulations started in mid 2016, with the aim of having regulations in place by the summer of 2019. The regulations are expected to come into effect in 2020. Over 2019-2020, the CTA will engage in education and outreach with stakeholders to ensure they fully understand their rights and responsibilities. Demand for the CTA's services in the area of accessibility is also expected to continue increasing should Bill C-81, the Accessible Canada Act, receive Royal Assent. Bill C-81 will provide the CTA with additional powers to carry out its mandate of protecting the human right of persons with disabilities to an accessible transportation system, including: own motion powers to initiate investigations into accessibility-related, transportation issues with the approval of the Minister of Transport; new monitoring and enforcement tools; new authorities to order compensation (lost wages, pain and suffering, and reckless practice); and higher maximum Administrative Monetary Penalties (AMPs) for violations of accessibility provisions. The CTA is enhancing outreach, education, and compliance monitoring activities, while working with other implementation agencies to align approaches and ensure a smooth, "no wrong door" experience for any person who wants to bring forward an accessibility-related complaint. With an aging population and increased passenger travel worldwide, accessible transportation is a global imperative. Because air travel so often crosses borders, clear and common accessibility principles at the international level are in the interests of both persons with disabilities and airlines. Accordingly, the CTA is working with partners in other federal organizations to increase the emphasis placed on accessible air transportation within the International Civil Aviation Organization (ICAO). As well, the CTA has convened and is continuing to support multi-stakeholder discussions on ways of addressing the growing challenges around the storage and transportation of mobility devices on aircraft. The international working group examining these challenges is expected to report on its findings and recommendations during 2019. In recent years, a record number of Canadians turned to the CTA for assistance with air travel issues. In 2018-19 alone, the CTA received over 7,500 air travel complaints – a more than ten fold increase from the 700 complaints that the CTA averaged annually over the five-year period spanning 2012 through 2016. It is anticipated that the regulations, once finalized, will come into effect during the summer of 2019. The CTA is also preparing to implement the regulations, including issuing guidance material for airlines and the public, developing new online products and ramping up of monitoring and compliance activities. For more information on the CTA’s plans, priorities and planned results, see the “Planned results” section of this report. Set and enforce economic, accessibility, and air passenger protection rules for the national transportation system; resolve disputes between transportation service providers and users through facilitation, mediation, arbitration, and adjudication; and provide information to stakeholders and the general public on the transportation system and their transportation-related rights and responsibilities. Update rail regulations to ensure rail related requirements are clear, up to date and enforceable. Implement new accessible transportation responsibilities if and when Bill C-81 is passed and comes into force, and continue efforts to coordinate with other implementation agencies to align approaches and a ' no wrong door' experience for complainants. Work with partners in other federal organizations to increase the emphasis placed on accessible air transportation in the deliberations of ICAO and facilitate multi-stakeholder discussions on the carriage and storage of large and/or complex mobility aids with aircraft. Continue to identify and implement improvements to CTA services aimed at maximizing the clarity, efficiency and responsiveness of dispute resolution and regulatory determination processes. Continue development and implementation of a data-driven, risk-based approach to compliance monitoring and enforcement activities. Continue efforts to raise awareness among stakeholders and the public on their transportation-related rights and responsibilities, and CTA recourses available to them. In this report, any reference to “obtain baseline information” in the target column refers to performance indicators that are in the first year of implementation. Results collected in 2018–19 will be used to establish performance targets for future years. Financial, human resources and performance information for the CTA’s Program Inventory is available in the GC InfoBase. For fiscal years 2016-2017 and 2017-2018, the amounts shown represent the actual expenditures as reported in the Public Accounts. For fiscal year 2018-2019, the forecast spending represents the planned budgetary and statutory expenditures as presented in the Estimates documents (Main Estimates and Supplementary Estimates). This amount has increased in comparison to previous years' forecast spending. This increase is primarily attributable to the new funding received to support the CTA's modernization initiative ($2,4M), as announced in Budget 2018, and to implement legislative and regulatory changes related to Canada’s freight rail system ($1.9M), as announced in the 2017 Fall Economic Statement. For fiscal year 2019-2020, the planned spending also reflects increased funding of $3.7 million approved through Main Estimates to pay for the costs related to The Government of Canada Workplace 2.0 Fit-up Standards. This amount is reflected under Internal Services Program and will be reimbursed over a period of 15 years. For the period 2020-2021 to 2021-2022, the planned spending reflects approved funding by Treasury Board to support the CTA's Strategic Outcome and Programs. These expenditures are slightly lower than in previous years since they do not include the reimbursement of eligible paylist expenditures and budget carry forwards as these cannot be estimated with certainty. The increase in Internal Services expenditures in 2019-20 includes an allocation of $3.7 million for a mandatory government initiative (Government of Canada Fit-up Standards) to make more efficient use of office space. For information on the CTA’s organizational appropriations, consult the 2019–20 Main Estimates. The Future-Oriented Condensed Statement of Operations provides a general overview of the CTA’s operations. The forecast of financial information on expenses and revenues is prepared on an accrual accounting basis to strengthen accountability and to improve transparency and financial management. 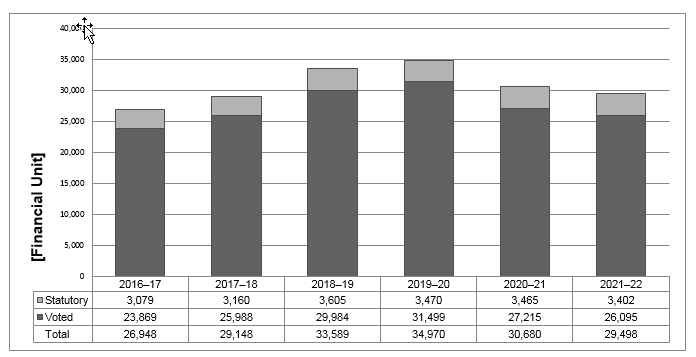 The forecast and planned spending amounts presented in other sections of the Departmental Plan are prepared on an expenditure basis; as a result, amounts may differ. A more detailed Future-Oriented Statement of Operations and associated notes, including a reconciliation of the net cost of operations to the requested authorities, are available on the CTA’s website. In 2018-19, the CTA received new funding to support its modernization initiative ($2.4M), as announced in Budget 2018, and to implement legislative and regulatory changes related to Canada’s freight rail system ($1.9M), as announced in the 2017 Fall Economic Statement. This incremental funding includes one-time allocations for specific projects ($1M). In addition to this, the forecast results for 2018-19 include the 2017-18 Operating Budget Carry Forward ($1M). These Acts, Regulations and Rules are available on the Department of Justice website, and are accessible through the Acts and Regulations section of the CTA website. “Raison d’être, mandate and role: who we are and what we do” is available on the CTA’s website. Set and enforce economic, accessibility, and air passenger protection rules for the national transportation system; resolve disputes between transportation service providers and users through facilitation, mediation, arbitration, and adjudication; and provide information to stakeholders and Canadians in general on the transportation system and their transportation-related rights and responsibilities. Supporting information on planned expenditures, human resources, and results related to the CTA’s Program Inventory is available in the GC InfoBase.